Rent Keep Memory Alive Event Center | Corporate Events | Wedding Locations, Event Spaces and Party Venues. The Keep Memory Alive event center can be transformed into the perfect venue for any special occasion, regardless of whether you’re hosting a fabulous Las Vegas wedding, elegant charity gala or high profile corporate event. From the mind of world-renowned architect Frank Gehry, the breathtaking Keep Memory Alive Event Center is as iconic as it is unique. Nestled in the downtown Las Vegas Symphony Park neighborhood and just minutes for all Las Vegas Strip Hotel & Casino properties, the Keep Memory Alive Event Center is truly a one-of-a-kind facility. Think of us as a blank canvas for your event; where extraordinary dining, an incomparable attention to detail, and the city’s most innovative LED light presentation come together to create a truly unique experience. For corporate or social events, receptions, meetings, galas, or any event you can imagine, our venue will exceed your expectations. 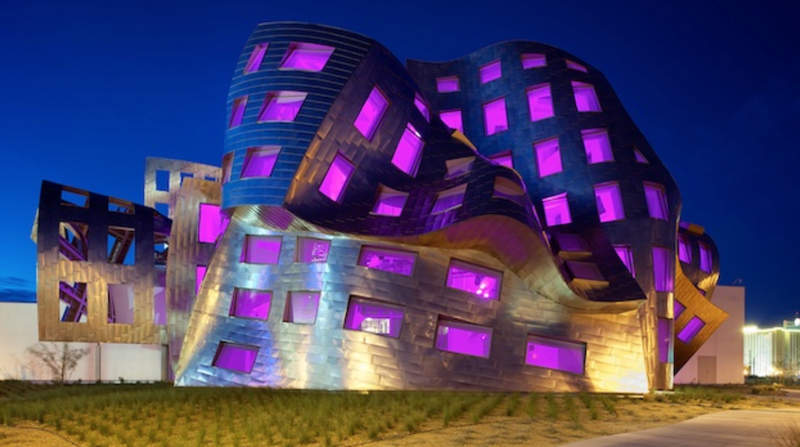 With 199 windows within an undulating stainless steel canopy, the Frank Gehry Vegas Event Center can accommodate 450 guests for a seated dinner and up to 700 for a standing reception. In addition to the indoor space, you may also consider extending your event into the breezeway and Gehry-designed garden for a reception up to 1500+ guests. A premier venue in Las Vegas, the center provides flexibility your event needs: indoor or outdoor, we’ll make your special day unforgettable. Along with your rental of the space, we also include the use of Frank Gehry-designed furniture and bars, custom Narumi china, sparkling Reidel glassware, high-end flatware, and custom Gehry-designed specialty linens with your rental; all at no additional fee. No rentals required: it’s all on property, and it’s all yours at no additional cost. The best part about choosing to host your event with us is that by doing so, you help us to preserve the memory of others. Event proceeds benefit Keep Memory Alive supporting the Cleveland Clinic Lou Ruvo Center for Brain Health core mission: enhanced treatment, research and the prevention of brain disorders.